At Country Home Motor Inn, it is our pleasure to offer quality customer service at a great price. 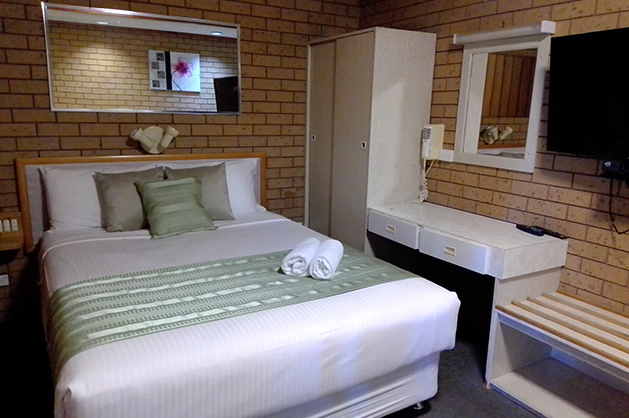 Come and experience our very quiet and comfortable ground level units all fully equipped with new queen size beds, reverse cycle air-conditioning, Foxtel with 55 chanels at no extra cost and and free Wi-Fi. Treat yourself to a night away and order a delicious breakfast conveniently delivered to your room, so you can enjoy breakfast in bed! We have an undercover barbeque area where you can spend a relaxing day socialising with friends, while lounging by the swimming pool. Our motel offers an onsite car park, including a double park in front of every room; a truck or trailer can also be accommodated for if required. Country Home Motor Inn, proud members of the Golden Chain.